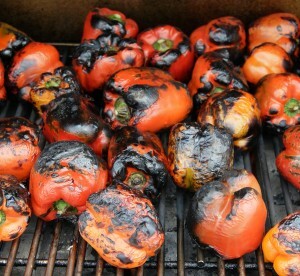 Rites of Fall: football,wine and roasted red peppers! I love this time of year. Football season is in full swing, the leaves are painting the mountains with blazing colors and I’m in the process of turning purple grapes into about 70 gallons of home made wine. And just last weekend, I completed the final rite of fall by roasting, peeling and bagging one of the most delightful treats imaginable. Every autumn for the last three decades, I have waited anxiously with bated anticipation for locally grown green bell peppers to turn large and red. Some years, because of too much heat or too much rain, the harvest can be less than bountiful and replete with small, gnarled red peppers. But even mal-formed, diminutive peppers can be transformed into the delicious Italian antipasto treat my mother lovingly made and passed on to me so many years ago. This year was- and still is -(at least for the next week or so) a banner year for red peppers of a size and shape that make the sometimes long and arduous task of processing them a lot easier. You can check out the recipe below for the routine detail, but mere words cannot describe the agony (sometimes) and ecstasy (always) associated with turning these red lovelies into edible bliss! 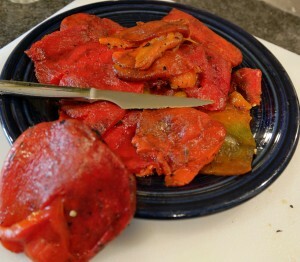 The agony is related to working with small peppers which can take two or three times as long to process as larger ones. But even this extra work is validated when you pull a baggie full of sweet red peppers out of the freezer in January, and experience a little taste of summer in the dead of winter. And while you can get sweet red peppers all year round at just about any super market, I eagerly await the ones I can procure locally. You may have noticed how expensive red or yellow bell peppers can be when purchased at grocery stores (sometimes as much as $2 a piece). I love to support our own Capitol Market where you can comparison shop among the many vendors and select just the right peppers at a very a reasonable price. I prefer to work with at least a bushel of peppers at a time, however, you may wish to start with a more modest number for your first effort. As a matter of fact, you can experiment with roasting just one or two on your stovetop and then follow the steps below. You can serve the peppers with small slices of crusty bread or even crackers, but you will need a medium to full- bodied red wine to make the perfect food and wine marriage. I suggest pairing the peppers with any of the following three wines: 2010 Antinori Peppoli Chianti Classico ($26); 2012 Easton Amador County Zinfandel ($18); or 2013 Bila-Haut Cotes Du Roussillon Villages ($14). The Bila-Haut is a terrific bargain for a wine rated 91 points by Robert Parker.